The holiday season upon us, and that means 2010 is simmering just below the horizon. Start your New Year off right with a chance to score a FREE read in one of the hottest up and coming genres around—Science Fiction Romance! 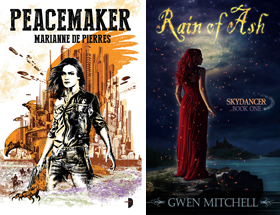 Heather Massey, the genius behind The Galaxy Express has worked relentlessly and tirelessly as an advocate of SFR and put together this incredible blog tour. I am excited to have been invited to participate and I know readers will love the chance to add to their TBR and discover some new authors. Here’s the scoop: 12 bloggers have teamed up with 17 authors for your chance to win over 30 SFR books. Whether you’re new to the genre, or a fan looking to add to her collection, this event is for you. 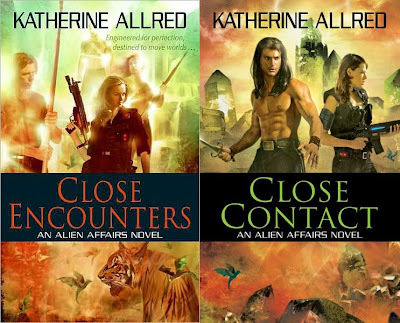 Here at SciFiGuy you have a chance to win a copy of Close Encounters by Katherine Allred and an ARC of her forthcoming sequel Close Contact (May 25, 2010), all you have to do is leave a comment for this post. Print book prizes are limited to U.S. residents. The deadline to enter is midnight on Friday, December 11, 2009. The winner will be announced on Saturday, December 12, 2009. Be sure to leave enough information in your comment so that you can be contacted. Note: The ARC of Close Contact is not yet available and will be shipped as soon as Katherine receives her copies. The Bureau of Alien Affairs needed a special GEP agent with empathic abilities to handle their most extraordinary assignments—and a rogue geneticist saw to it that Kiera fit their specifications. But she turned out stronger, faster, smarter, and more impervious to harm than anyone anticipated. A reluctant "superhero," Kiera wishes she were normal, but it is not to be. On Orpheus Two, the indigenous Buri race faces extinction, a prospect the powerful Dynatec corporation welcomes and, in fact, may be actively hastening. It is Kiera's job to protect these beautiful, exotic aliens . . . and to discover what there is on Orpheus Two that Dynatec feels is worth killing for. But the magnetic allure of Thor, the breathtaking Buri leader, is proving a dangerous distraction. And now, to save Thor's people, Kiera will need a power she's never before possessed—something hidden in the unexplored recesses of her heart. But don’t stop here! Increase your chances of winning even more books by visiting all of the participating blogs. You can view all of the prizes on the specially created Amazon Listmania and I have also included the covers at the end of the post. It’s easy: Just click on one of the links to the participating bloggers below. Make sure to leave a comment on the post titled “SFR Holiday Blitz.” From there, you can then jump to the next blog. There’s a wide variety of books to win so why miss out? For those interested in finding out more about SFR visit Internet Voices Radio and listen to the December 1 audio podcast hosted by SFR author Rowenna Cherry with guest authors Ella Drake and Lisa Paitz-Spindler, and bloggers Heather Massey and Doug "Sci-Fi Guy" Knipe. SFR Holiday Blitz - sending wishes for good health and good books in the upcoming year! Also, what an awesome way to publicize these great blogs. There are many that I haven't ever visited before, enjoying the tour de blogs! Awesome. I'm in! Thanks for the opportunity. Have a great holiday/Christmas/whichever! And thanks! two of my fave genres put together...count me in please! I'm one of the participating authors/bloggers and would like your visitors to know that Alien Romances is giving away eight books donated by Susan Kearney, Linnea Sinclair, Jacqueline Lichtenberg, Susan Sizemore, Margaret L Carter, and yours truly, Rowena Cherry (two of us are giving away 2 books). Those are some awesome covers! Hi Doug - great contest! I've not read much scifi and would be open to trying any of these books. Thanks and Happy Holidays! Thanks for the contest - put my name in as well.. I really enjoy reading books from this genre so thanks so much for hosting the SFR Holiday Blitz! I'm thrilled this SFR Holiday Blitz is on! And these books look fabulous. I have never read this hybrid genre before, but it looks really fun. Please enter me! I've been an SFR fan for years. Thanks for spreading the word about it! Wow! Those look really good. This contest is introducing me a several authors I haven't tried before. Thanks for the opportunity to win the Allred series! I love SciFi Romance. I especially love Linnea Sinclair, Ann Aguirre, Susan Grant and Susan Kearney. I'm not familiar with Katherine Allred, so I'm excited to learn more about her writing. The books sound really interesting. I'm in. Thanks. Wonderful - count me in! This blog is so detailed. I'll definitely have to come back. Free books, though, that is surely appealing. Great prize - I'm in! I would love to win. SFR is one of my favorites. SFR Holiday Blitz - Good luck to all. Thanks for the contest. Have read some SFR and would like to read more. Okay, I need to repost now that I am signed in to my google account.. I just got the first one in this series. And would love to win the second in this series. Oooh...those are seriously awesome covers! I am so excited to hop from blog to blog and discover all sorts of new authors and titles to start adding to my ever growing collection. Katherine's books sound great, and I love SF romance! I've been reading sci fi all my life and would love the chance to find some new and exciting authors. I can't afford to buy many books so this would be a great thing for me. Thanks for the opportunity! Love the idea of the SFR Holiday Blitz. This sounds awesome! Count me in. Great contest! Those covers are gorgeous! How awesome would it be to win free books!!! Wow! What a neat contest! And what a neat way to discover new authors - and new blogs. SFR Holiday Blitz - What a great contest and such an innovative way to involve some of the best bloggers around (SciFiGuy, you know I love 'ya). I'd hyperventilate (but I won't pass out...promise) to win a few of these books. They all look incredible. The books sounds fabulous! Yay SFR holiday blitz! Have a happy holiday! The SFR Holiday Blitz sounds great! Hope I can win to get to know the SFR genre better. Great contest! Thanks for spreading the genre around. I gotta be in it to win it! Please add me to the SFR Holiday Blitz excitement! SFR Holiday Blitz sounds like fun - some of these authors I've never heard of, so w00t! Scifi guy, what a great contest..Thanks for posting the Holly Black cover. I love her work. Good times. :) Thanks for this. Haven't read Katherine's books yet, thanks for the contest so I have a chance at it. This season is expensive for me, 11 family members with birthdays November/December and then there's Christmas... wheeee! It's Winter once again, and this give-a-way is a fantastic idea. A bunch of authors new to me, and (if I win) something to while away the hours snowbound. SF Romances are a new concept to me - only just heard of the subgenre today. I've read regular SF for many years and am curious to see if I like SF Romances too. SFR Holiday Blitz -- what a great idea! It's fun discovering all these blogs I hadn't found and books I hadn't heard of. It's been a wonderful evening's tour. SFR is my fave genre! Go SFR Holiday Blitz! sfr holiday blitz-count me in i love finding new to me authors more great books to read awesome contest. SFR Holiday Blitz, thanks again for this contest. SFR Holiday Blitz....please enter me too!!! This is so much fun and I'm finding lots of new blog sites and authors I did not know about....Thank you and Happy Holidays to All!!! SFR Holiday Blitz: Thanks for the contest and Happy Holidays! Not a US resident. Supporting the genre and the contest, anyway. Tor.com told me about the SFR Holiday blitz, and I'm having a lot of fun seeing a lot of new blogs. Thanks for the contest. Thanks for having the SFR Holiday Blitz! Happy Holidays everyone! Katherine's books look awesome - hope I win! Thanks for the chance to win such fun books! Woot. :) I love these. Please enter me into your SFR Holiday Blitz contest. Thank you and Happy Holidays. What a terrific giveaway! Thanks for hosting it--these books look like a lot of fun! Happy Holidays! SFR Holiday Blitz -- awesome deal -- thanks! I'm also enjoying the blogs. SciFi love it can't get any better than that. A whole batch of brand new books for me to read? Totally worth the price of admission if I win. I'm thrilled to my toenails to see all the buzz this contest is generating. Genres thrive and survive only with reader interest, so please keep the SFR love coming! It's my favorite genre to read and write! SFR Holiday Blitz - I am sooooo in! Love the blog! Thanks and have a fabulous holiday and 2010! Cool! I'm in. Love the chance at free books. This looks like a great series. I can't say that I've had much experience with SFR, but I'm looking forward to broadening my reading horizons. SFR Holiday Blitz. Katherine Allred is a new author to me so I'd be very interested in receiving her books. I'd love to get my hands on these titles. I'm writing my first novel now and suspect it would be marketed as a science fiction romance. But I definitely need to research this genre and find some great, comparable novels. More fun books to try to win. Thanks for participating in this contest. Please enter me. These sound great! Thank you! New books and blogs to read! Very cool! Thank you for the introduction to a new author and for the contest to celebrate the holidays and SFR! I would love the chance to read new authors I tend to buy all my favorites then wait months for there releases because they are sequels. love this giveaway blitz! these books sound awesome! I'll enter. Thanks for putting this on. Cheers. As a sci-Fi geek who lives romance novels, I've got to say that this is on of the coolest book giveaways I've come across. Aah. A SFR author I've not heard of. fantastic contest. Thank you for also introducing me to some fantastic web sites. Count me in. My TBR shelf hasn't caved under the weight yet, so a couple more books will be welcome! The blurb makes me want to put both the books on my TBB list. Thanks for the SFR Holiday Blitz contest, count me in, and thanks for the Chelsea Quinn Yarbro blogtour entry... Happy holidays!